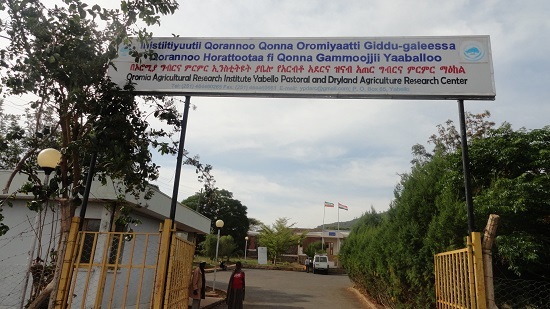 Adapt, generate and disseminate appropriate technologies needed for sustainable development of range land resources of pastoral and agro pastoral areas of Ethiopia. Crop technology projects/activities are undertaken by three research teams. Namely;- cereal, pulse and oil crops, horticulture and spice research teams. Currently socio-economic research projects are being undertaken by two research team. Yabello is located 570 km south of Addis Ababa on the tarmac road to Moyalle at an altitude of 1750 masl with annual mean precipitation of 500 mm. In the area, bimodal rainfall peaks are conspicuous. The main rainy season (which occurs between March and May) gets 60% and the remaining 40% goes to the short rainy season (that extends from September to November). Mean annual temperature varied from 19oc-240c. The major resource challenges are water stress, ecological change (bush encroachment) and frequent drought.